“Dark Shadows” premiered on June 27, 1966, on ABC TV. 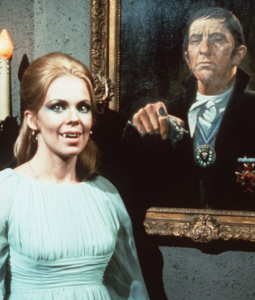 I was one of those kids who tore home from school to watch the monsterific soap opera “Dark Shadows.” (I was so obsessed with not missing a moment, I often caught the last minute or two of the preceding soap, “General Hospital,” and began following those storylines a bit as well. I remember a doctor and a nurse were secretly in love.) 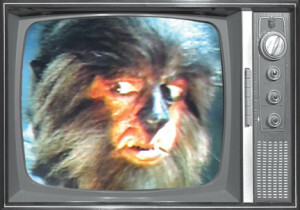 The “Dark Shadows” section in “Monster Mash” presents interviews with series creator Dan Curtis and 12 cast members. 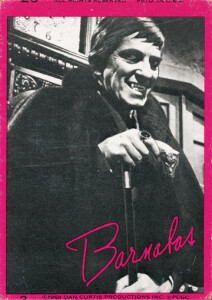 Following are short excerpts from interviews with Jonathan Frid (Barnabas), Kathryn Leigh Scott (Josette), Lara Parker (Angelique) and David Selby (Quentin). 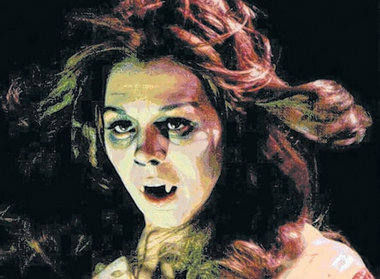 From the overview on “Dark Shadows”: It was a monster fan’s dream come true: A daily soap opera featuring vampires, werewolves, a Frankenstein type, a Van Helsing type, a Dr. Jekyll and Mr. Hyde type, witches and ghosts. Everything, it would seem, except a Godzilla type raining nuclear fire on foggy, gloomy, drizzly Collinsport, a coastal New England village where the weirdest things happen. 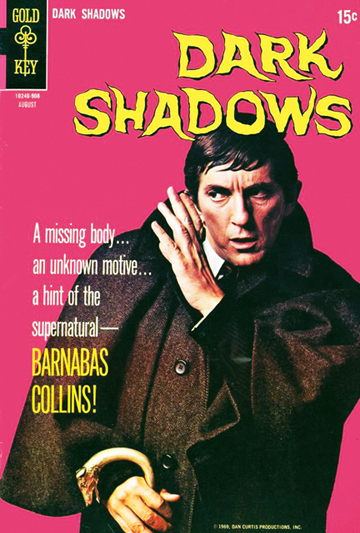 When “Dark Shadows” debuted on June 27, 1966, it was different from an average daytime drama, if still a far cry from the monster rally it would become. Initially broadcast in black and white, “Dark Shadows” began as a soap infused with mystery, as young Victoria Winters (Alexandra Moltke) took a job as a governess at Collinwood, ancestral home of the crusty, old-money Collins clan. When series creator Dan Curtis introduced the show’s first supernatural storylines — the ghost of Josette (Episode 70, Sept. 30, 1966) and the flame-engulfed phoenix Laura Collins (Episode 191, March 30, 1967) — he saw a bounce in the ratings. 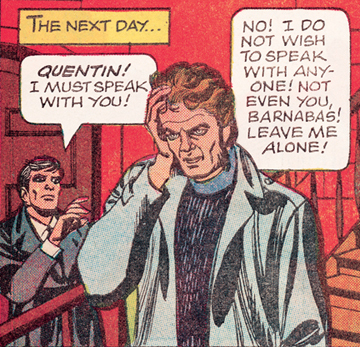 Thereafter, Curtis and his writers kept the scary coming. It all led to the introduction of 18th-century gentleman vampire Barnabas Collins on April 18, 1967. The casting of Canadian actor Jonathan Frid — handsome in an odd way, and a little bit sad — was pure kismet, a perfect pairing of player and role. Barnabas was no wild-eyed bloodsucker; he was a reluctant vampire who regretted his kills and was capable of feeling love. Barnabas found a rival for his place on the cover of 16 Magazine in pulchritudinous werewolf Quentin Collins, played with an intense gaze and fuzzy mutton-chops by David Selby. 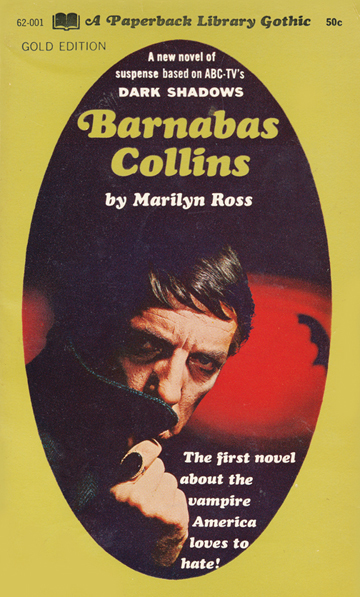 You could learn a few things by watching “Dark Shadows.” Who knew that Barnabas walling up Reverend Trask with brick and mortar was a literary allusion to Edgar Allan Poe’s “The Cask of Amontillado”? (Actually, back then, who knew what a “literary allusion” was?) 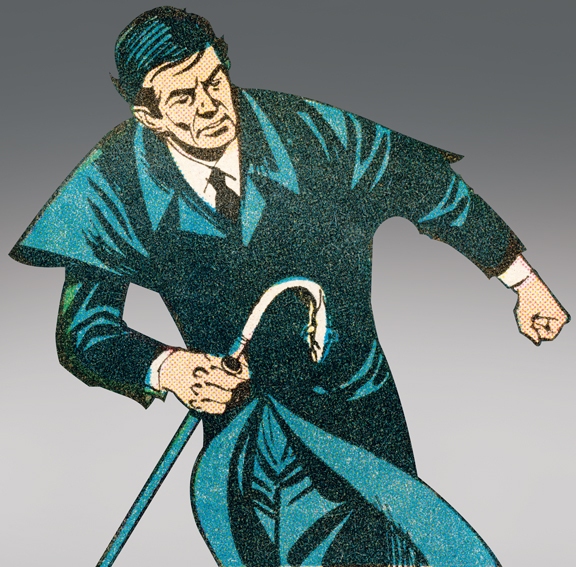 The show challenged the laws of physics with its penchant for time-tripping. Storylines were set in 1795, 1897, the contemporary 1960s, the future and parallel time. Lara Parker on filming Angelique’s incantation scenes: “My eyes were my gift. Everybody gets one. I was lucky to have big, blue eyes. They would change color with what I had on. They wanted me to stare right into the lens (during incantations). “The problem with the incantations is that they were hard to learn, because they were just a bunch of words that weren’t really connected to anything. ‘I call on the powers of darkness to …’ so on and so on. “A lot of times, I ended up reading them off the teleprompter. You would see my eyes dart over to the side and then back to the lens,” Parker added with a laugh. David Selby on his debut as Quentin: “It was about three months before the character ever spoke. I was worried that once I opened my mouth, they won’t want me. “Monster Mash” also spotlights “Dark Shadows”-related memorabilia and print products such as Paperback Library’s series of novels written by, ahem, “Marilyn Ross,” and Gold Key’s comic books illustrated by Joe Certa (co-creator of the DC Comics’ character Martian Manhunter).